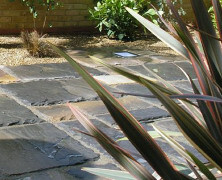 Indian sand stone paving for UK patios. 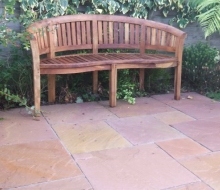 If you like a natural looking patio then Indian sandstone is a good option for consideration. It's much cheaper than traditional British stone like Yorkstone and it can look just as good. There are plenty of earthy looking colours available with a multitude of variations from your beige, black, brown, green, grey, mint, red and yellow. It is important to remember that the name attributed to the colour covers the average, not the lighter and darker aspects of the stone. For example, black (which is usually dark grey/black) can have hints of brown, sandy yellow, red and grey blue. As you can see from the adjacent picture, these shades of colour are far more subtle than they sound. There are usually between 4 and 6 different sizes with many more possible. Paving, landscaping contractors and builders tend to like working with 300 mm x 300 mm, 300 mm x 600 mm, 600 mm x 600 mm and 600 mm x 900 mm or 1 ft x 1 ft, 1 ft x 2 ft, 2 ft x 2 ft and 2 ft x 3 ft in imperial measurements. Sizes like 280 mm, 560 mm and 840 mm are becoming more popular. Thickness varies from 2 cm to 5 cm and it's all strong stuff, if a load of paving slabs drop from one side of the crate to the other it is very rare for any to break, unlike your manufactured ones! Scratches and scrapes are no problem either. You can order specific numbers of each size or opt for patio packs which are well balanced in proportion. Other products in sandstone and limestone include circle kits, cobbles or setts. When looking to buy there are lots of suppliers in the North of England who until recently were cheaper even after taking into account the extra haulage costs for deliveries to other parts of the UK. Now there are a number of South of England suppliers with stone for sale at competitive prices so shop around before committing. The quality is important, although unlike early imports, most of the sandstone now on sale from these stone traders is of a universal standard. If you want to use Indian sand stone for your driveway a deeper than usual sub base and base will be required, the stone will also need to be on the thicker end of the scale. It may also be advisable to use expansion joints as with concrete drives to reduce the amount of movement even though the design would be compromised. (1) : Ground stabilising membrane. (2) : Good sub base of well compacted material such as type one stone, on average 50 mm deep. (3) : Full concrete sub-bed + 5 contact bedding points for laying the sandstone approx 50 mm deep. After tapping down, butter up the edges before laying the next stone. Use either grit sand (sharp sand), 10 or 20 mm ballast, or a gravel and sand mix. If you can get it, the 10 mm ballast and sharp sand mix seems to be the best all rounder. The strength of this mix can be anywhere between 5 and 10 parts ballast to 1 part cement, and a mix that is moist but not soaking works well. Spacing will range from 1 to 3 cm depending on the combination of stone sizes in a given area. If you have a general builder doing the work make sure they don't lay the stone on normal building sand and cement mix. (4) : Finishing the joints can be done with a swept mix of sharp sand, building sand and or kiln dried sand at around 5 parts to 1 part cement. Start by mixing the sand and cement by hand with a shovel or spade in a wheel barrow then add a little water and continue mixing to the point where the mix is damp enough that no dust is coming from it, and that it will cling together. Brush in at a 45 degree angle working over an area no greater than 6 sq metres at any one time. Force the mix deep into the joints, compressing by hand or with tools, then sweep over once more to tidy. Brush the slabs clean. Mist with water initially, leave for approx 15 minutes, follow with multiple damping down to set off. Don't give the area too much water too early. If you haven't done this before experiment on something else before starting! Light cement stains will usually clean off without any problems, but some types of stone are not suitable for this. Another method is the traditional pointing with a wet mix of sharp sand, building sand or mixture of the both at 4 or 5 parts to 1 part cement. If the joints are on the wider side then using just building sand in the mix can result in sections of mortar breaking up early, so sharp sand is better. The final choice is a manufactured compound containing sand and resin that sets after a few hours. Some of these jointing systems start to stiffen after a matter of minutes so be careful not to take on too bigger area at a time. The dryer swept and damped method gives the most natural look, is durable, cost effective and faster than pointing. It is important to keep the finished level below that of the stone surface for maximum effect. For a really good contact joint the paving as it's being laid. This is more time consuming but can be worth it. When cleaning the patio in the future it is not recommended to power wash the joints in any case. Just use detergent, a broom and water. Which way up? : Sounds strange but there are of course two choices. For a more natural, rugged look the edges should slope down from the top (like a mountain). For a smoother look turn the slab upside down. With this option the jointing work is made easy, however it is very difficult to force the finishing mix right under the edge of the slab so there can be some strength concerns for later with this method. Allow 2 to 3 days before walking on any stones once the main laying of an area is completed. If you have no choice, step on the middle of a slab. This is definitely reading like a guide to patio paving with sandstone but this didn't start out with that intention, just to be (hopefully) useful, handy information for the DIY side or potential customers. If you need an exact colour there are plenty to choose from (if they're available at the time). Digital photographs can be a good way of choosing so long as the image is taken in natural light with limited sunlight and flash. To be absolutely sure, small samples are favourite. There are just so many different colours on the market with only a few universal names used, choosing can be a difficult decision. Along with location names like Andhra Pradesh, Betamcharla, Cuddapa, Dolphur, Jaisalmer, Kandla, Lalitpur and then the shades of (in no particular order) red, brown, bronze, copper, gold, yellow, orange, pink, green, mint, fossil, teak wood, black, white, lemon, modak, chocolate, grey, coral,and why not throw in words like raj, autumn, leaf, antique, flamed, sahara, camel, rainbow and mango. Standard hand split or tumbled finish. Sorry, which colour was that? For the supply only of sandstone, don't forget to check and add on the delivery price, something that can vary significantly. If ordering stone that hasn't arrived at the UK suppliers yet, be careful as the shipments and their clearance through customs have been known to get held up, with sometimes long delays......So there we are, happy paving! For a professional service Rob McGee & Son design, build and renovate garden patios using both natural and manufactured products in Kent, London and South East of England gardens. For further information on the services available from this landscape gardening company please call 01233 740 389.